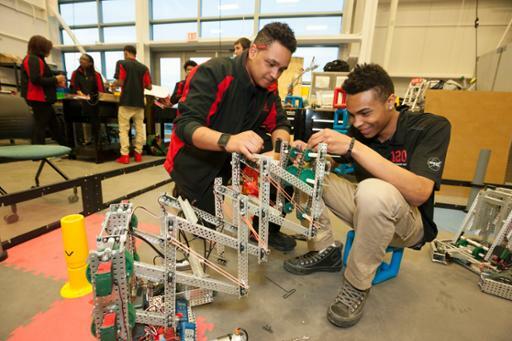 What did participating in the FIRST Robotics Competition through the Youth Technology Academy at Cuyahoga Community College (Tri-C®) do for Dontavius Jarrels? “It saved my life,” he said. Jarrels is one of several YTA alumni and students interviewed in a video by FIRST (For Inspiration and Recognition of Science and Technology), a worldwide nonprofit organization dedicated to STEM engagement for youth. The short documentary outlines the program’s life-changing impact on YTA team members, who come from schools within the Cleveland Metropolitan School District. FIRST posted the video on its YouTube channel on July 25. A team of students from Tri-C’s academy won the international FIRST Robotics Competition Championship in 2016. The competition is designed to introduce high school students to potential careers in engineering, science and technology. “This is an avenue for ... encouraging them to pursue positions and opportunities that will help elevate them out of their current economic situations,” said William H. Gary Sr., executive vice president of Tri-C’s Workforce, Community and Economic Development division. For information on the Youth Technology Academy, visit the program’s website or call 216-987-3368.